Sure, recruiting is a lifeline for any college sports program. No matter how good the coach or the coaching staff, winning regularly without talent and depth is a difficult task. Finding such talent during the recruiting process is essential, and it’s a skill that separates the Urban Meyers and Nick Sabans of the college football world from the Gerry Fousts and Johnny Majors (at least during his second stint at Pitt). We’re given national, regional, state and district rankings from every site from ESPN to fan blogs. Players aren’t known as much by name as the number of stars sites like Rivals, Scout or ESPN assigns. Follow those sites and find out when a player is visiting a school and attending a nationally televised basketball game or when that same player narrows 73 scholarship offers to five programs. Coaches are criticized for not bringing in enough four- or five-star recruits. Recruits are analyzed like they’re entering the NFL Draft. It’s nauseating, and it’s the most inexact science in sports. And it all culminates every year with the worst day on the sports calendar – National Signing Day, which happens to be today. Starting in the morning, fax machines (yes, National Signing Day ensures these devices are still created) light up in college football offices across the country. Twitter, Facebook, Instagram and recruiting websites monitor every National Latter of Intent sent. It’s silly, yet essential. Without good recruits, there’s no chance of winning. Yet, the analysis is overdone. Look at Pitt for instance. Two of the Panthers’ best players in 2014 – James Connor and T.J. Clemmings – weren’t sifting through offers from national powers. Yet, Clemmings is a possible first-round pick in the upcoming draft and Connor enters next season as the ACC Player of the Year. For days leading into Signing Day, we’re told how Antonio Brown – the best receiver in the NFL these days – was an afterthought in the recruiting process. Not many schools wanted offensive lineman Eric Fisher, the No. 1 pick in the 2013 NFL Draft. Finding players like Brown and Fisher are what separates a decent recruiting class from a good one. As for those four-and five-star recruits, rankings are often bestowed upon them at camps, when looking good in the uniform matters more than how the player performs in it. There’s an overhyped offensive lineman from Western Pennsylvania who earned a bunch of stars but couldn’t make first- or second-team all-conference as a senior. So many other factors aren’t weighed on Signing Day. That five-star recruit may be a head case. He may miss mommy too much. He may have a pregnant girlfriend back home. Worse yet, all three. Good luck keeping that guy from playing in the PSAC two years from now. It’s inexact and over-the-top. And it’s affected everything from Division II swimming to Division track. Because of the attention paid to Division I signings in football and basketball, high schools everywhere are holding “signing ceremonies” – a ridiculous display of lies. For starters, athletes don’t sign to play for Division III athletics. The reason? There is no athletic scholarship money in Division III. Another common foible in recruiting are the service academies. If someone plays football for the U.S. Naval Academy, that athlete doesn’t sign a National Letter of Intent, he accepts an appointment. As for Division II sports, unless the athlete is playing football, basketball or wrestling, it’s highly unlikely much scholarship money is involved. Yet, high school hold these ridiculous events to appease parents and kids. Do me a favor, next time you see a “signing ceremony” on your local newscast, look to see if the athlete is actually signing something or just doodling on a blank paper. I’ll take the latter and give you 100:1 odds. This entry was posted in College basketball, College football, High school football, Pitt, Sports and tagged National Letter of Intent, National Signing Day, NCAA, Penn State, Pitt, Signing Day, WPIAL on February 4, 2015 by mikekovak. That means I’ll always remember a 6-foot-2, 225-pound black man from Natchez, Miss., with the perfect combination of speed, strength and athleticism. His name is Hugh Green, but you can call him the greatest defensive player in the history of college football. Sorry Manti Te’o, Charles Woodson, Deion Sanders and Steve Emtman fans, those guys were nowhere near as devastating, game-altering and menacing as Green, an unheralded recruit as an undersized defensive end whom Pitt coach Jackie Sherill convinced to come to Oakland. 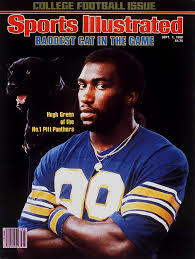 College defensive players rarely graced the cover of Sports Illustrated before Hugh Green did. From 1977 to 1980, Green destroyed offensive lineman. The greatest player in Pitt history – with all apologies to Tony Dorsett, Larry Fitzgerald, Bill Fralic, Mike Ditka and Dan Marino – started immediately, and instantly made an impact. In his first game, which just happened to be against Notre Dame, Green finished with 11 tackles, two quarterback sacks and a blocked punt. Not bad for a freshman who Pitt noticed while recruiting running back Rooster Jones. Green’s reign of defensive terror was only getting started with that Notre Dame game..
As a sophomore, he was a first-team All-American and made Pitt’s all-time team. And let’s not forget that, in the late 1970s and early 1980s, Pitt was what Miami (Fla.) would become in the late 80s and early 2000s – a football factory rife with future first-round picks and hall of famers. 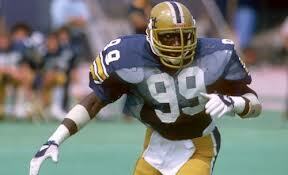 His All-American ways continued in 1979 and 1980, and Pitt retired Green’s number during his last home game. His final numbers are eye-popping and awe-inspiring – 460 tackles, 52 tackles for loss, 53 sacks, 24 forced fumbles, 13 fumble recoveries and 76 quarterback hurries. Green finished second in the 1980 Heisman balloting, losing the award to an inferior player in South Carolina running back George Rogers. He won the Walter Camp Award, Maxwell Award and the Lombardi Award and was named everybody’s player of the year. He’s made every all-time college football team worth mentioning. Folks, let’s remember all these stats and awards were compiled despite coaches constantly game-planned against Green and stayed away from him as often as possible. I’ll know I’ll never forget. Some of my first memories – I was born in 1974 – are of Green playing for Pitt. At the time, I was a youthful sports sponge, soaking in all the college and pro football I possibly could. I loved Pitt football, and I loved Penn State football. The family loved the Nittany Lions, one reason being my dad’s cousin – Chuck Fusina – once finished second in the Heisman balloting as a PSU quarterback. And I liked watching Curt Warner run almost as much as watching Green wreak havoc. And a lifelong Pitt football fan was born. I got to thinking about Green recently as talk of recruiting season and Signing Day increase in front of Feb. 4. Green wasn’t a heralded recruit, much like Panthers running back James Conner, but he quickly evolved into an all-time great. And the current Pitt coaching staff is working hard on the recruiting trail, with a renewed focus in Florida. Finding players like Green, Conner and Antonio Bryant will be as vital to Pitt’s success as landing the next four-star recruit from a WPIAL high school or eastern Ohio powerhouse. Pitt can only land so many elite prospects. Grabbing steals will determine this new staff’s success. This entry was posted in College football, Pitt, Video and tagged Bill Fralic, Dan Marino, Heisman, Hugh Green, Larry Fitzgerald, Mark May, Notre Dame, Penn State, Pitt, Pitt football, Tony Dorsett', YouTube on January 21, 2015 by mikekovak. Jamie Dixon guided Pitt basketball to the NCAA tournament in 10 of his first 11 seasons as a head coach. And the one year Pitt failed to qualify for the Big Dance, it won something called the CBI tournament. Granted, the majority of Pitt’s appearances in the NCAA tournament ended early. There’s been one Elite 8 appearance, accompanied with a heartbreaking loss to Villanova. Take that run away, and it’s mostly losses to teams seeded lower than the Panthers, though it should be noted at least six teams that knocked Pitt out advanced to the Final Four, including Florida last season. What Pitt lacks in splashy tournament wins, it makes up for in consistency. Pitt’s string of tournament appearances puts it in elite company. Maybe cranky Panthers fans will appreciate that consistency later this year, assuming Pitt fails to advance to the NCAA tournament. At this point, two games into the ACC season, Pitt looks anything but a tournament team. At 11-4 overall and 1-1 in conference, Pitt’s best win probably came against Kansas State, which isn’t saying much. It’s next best win might be against Florida Gulf Coast. There was a bad loss to Hawaii, and blowout losses to Indiana, N.C. State and San Diego State. Against better competition, Pitt’s looked overmatched. Heck, against Boston College Tuesday night, the Panthers looked like a bad basketball team. Yet, thanks to a three-minute flurry at the end of regulation and the play of Josh Newkirk in overtime, the Panthers escaped Chestnut Hill with a one-point victory. That win triggers two thoughts: 1. Decent teams find ways to win when they play poorly, and, make no mistake, Pitt absolutely stunk for 37 minutes against Boston College; and, 2. Pitt could be in for a long season. Leaning toward the latter of those two thoughts, but Pitt’s pulled surprises before. Pitt could falter in conference play much like the Ashton Gibbs-led (and let’s not give Gibbs much credit for being a leader) squad in 2011-12 that won the CBI or continue to improve like the 2009-10 unit that lost in nonconference play to Texas and Indiana in addition to dropping four of five games during a brutal stretch of Big East play. That team ended up with a three seed in the NCAA tournament and ended its season with a tough loss to Xavier. This Pitt team isn’t good enough to earn a three seed, but it could gradually improve, much like the 2009-10 team. This Pitt team is undersized. Michael Young is playing out of position. So is Ryan Luther and Sheldon Jeter. The Panthers don’t own a true post presence. There’s no one inside to funnel the defense to when a player gets beaten off the dribble. Shot selection is poor, occasionally pathetic. Cameron Wright is far from last season’s form, the possible lingering effects of his foot injury. Newkirk occasionally plays out of control. Durand Johnson is suspended for the year. Derrick Randle has regressed, and the same could be said for James Robinson. Jamel Artis looks like Pitt’s second best player for a few games, then struggles to stay on the court in others. It’s a wildly inconsistent group, but that is going to be part of the fun watching Pitt. There’s nothing that can be taken for granted with these Panthers. For once, penciling them into the NCAA tournament isn’t a given, and this group is going to be challenged at every stop on the schedule. But, the guess here is Pitt, like most Dixon teams, will improve. Will be be enough to get into the NCAA tournament during a season of transition? It’s going to take winning games like the next three at home and finding a way to beat a team or two it shouldn’t. I wouldn’t bet against it, but it is tempting. This entry was posted in College basketball, Pitt and tagged ACC, CBI Tournament, Jamie Dixon, Michael Young, NCAA Tournament, Pitt, Pitt basketball, Pitt Panthers on January 8, 2015 by mikekovak. If the primary argument in retaining a coach is program stability, it’s not a ringing endorsement for the job being done. And stability seems to be the main reason some Pitt football fans want to see head coach Paul Chryst remain stay for a fourth season. Chryst’s name emerged Wednesday as a potential replacement for Gary Andersen at Wisconsin, though it’s all speculation. Andersen departed Madison abruptly after two successful seasons for the football riches of Oregon State. Andersen’s move is a curious one, and an indictment of how the coaching world views the Wisconsin job. Chryst heading to Wisconsin makes sense. He grew up in Madison, played quarterback for the Badgers and earned praise for his work as the Badgers’ offensive coordinator. His work as OC led Langeloth native and Wisconsin AD Barry Alvarez to unabashedly endorse Chryst for the job at Pitt. And when Bret Bielema left Wisconsin for Arkansas, Alvarez said at the time he wouldn’t feel right plucking Chryst after only one year at Pitt, and after Alvarez vouched for him. But times change. Who would have thought a decade ago, when Alvarez ran one of the country’s best football programs, that Wisconsin would become a revolving door for head coaches. What Alvarez said about Chryst two years ago was … two years ago. It’s hard to imagine Alvarez not at least gauging Chryst’s interest, and it’s even tougher to imagine Chryst not being interested. Not that Chryst did much to distinguish himself at Pitt, where the game-day atmosphere probably reminds him of coaching against Indiana or Purdue. And Chryst’s spotty record could be a determining factor at Wisconsin, which no doubt wants to quell the label of being a stepping stone to other jobs. In three years at Pitt, Chryst owns a 19-19 record heading into the Armed Forces Bowl, which pits the Panthers (6-6) against Houston (7-5) in Fort Worth, Texas, Jan. 2. Granted, Chryst didn’t unravel a program in desperate need of solid coaching when he was hired to replace Todd Graham, who was hired to replace Mike Haywood, who was hired to replace Dave Wannstedt. Chryst provided stability, and it’s difficult to say the Panthers don’t appear to be headed in a good direction. Pitt’s three best skill players – ACC Player of the Year James Conner, Tyler Boyd and Chad Voytik – are all sophomores. The offensive line displayed consistent improvement. Players responded to an awful stretch with two wins to end the regular season and become bowl-eligible. But inconsistency elsewhere characterizes Pitt football during Chryst’s tenure. The defense struggles to make stops. There are head-scratching losses to the Akrons of the college football landscape. Pitt regularly snatches defeat from the jaws of victory, as recent results against Duke and North Carolina prove. Pitt rarely lands top recruits, and for every two-star guy like Conner that succeed at Pitt, there are 10-15 four- and five-star guys within Pitt’s recruiting base excelling at other schools. Should Chryst stay at Pitt, and the guess here is the Panthers will have an interim coach for that bowl game against Houston, he’ll enter a make-or-break year. Marked improvement will be expected in Year 4. If there’s another 6-6 season, or even a 7-5 one, Chryst will likely be looking for work. So why take the chance? Chryst could land several years of job security at Wisconsin. Whether or not he can coach in Alvarez’s shadow will likely determine his answer if he’s offered. 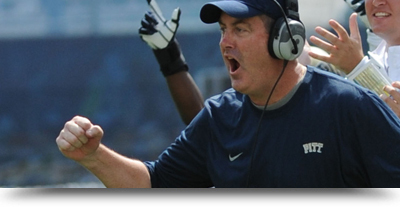 And judging by Chryst’s unspectacular demeanor displayed at Pitt, that won’t be a problem. Then, Pitt’s revolving door will be moving again. This entry was posted in College football, Pitt, Sports and tagged Barry Alvarez, College football, NCAA, Paul Chryst, Pitt, Pitt football, Wisconsin on December 11, 2014 by mikekovak. Friday was a somber day for news. A school shooting left at least two people dead in the state of Washington, and a one-man-crime-spree shot three deputies, killing two. Mindless, needless tragedies occurring about the same time. In Pittsburgh, more accurately in select parts of Western Pennsylvania, Friday wasn’t somber. It was joyous. The script returned to Pitt Friday. Yes, that’s a helmet. It’s the head gear worn by the University of Pittsburgh football team, or Pitt, as it’s been known in athletic circles for decades. 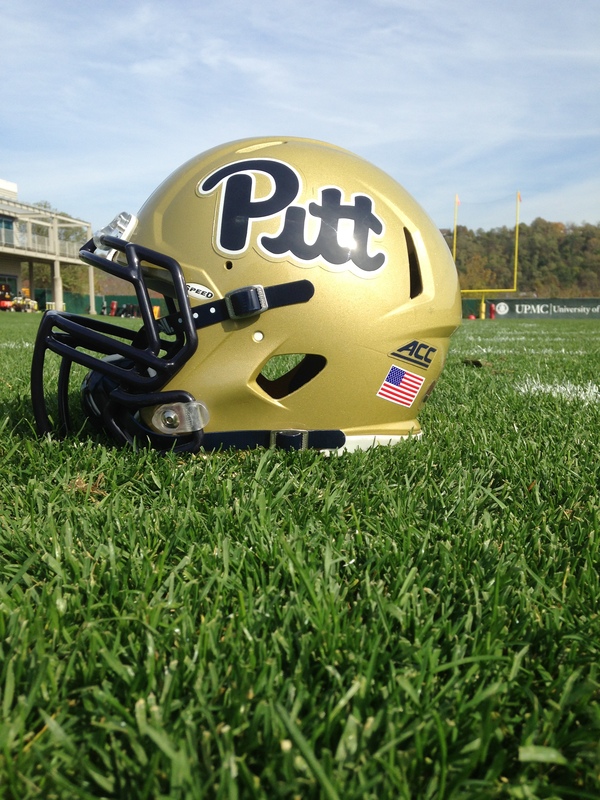 The script helmet, a design of former head football coach Johnny Majors, symbolizes the best era in modern Pitt football – 1973 through, let’s say, 1985. Pitt was an NFL breeding ground in those days. Tony Dorsett, Mark May, Hugh Green, Dan Marino, Bill Fralic, Jim Covert, Rickey Jackson, Curtis Martin and many other top-shelf talents wore the script. Then, not long after Steve Pederson arrived as Pitt’s athletic director in 1996, Pitt became Pittsburgh and the script disappeared. Nevermind that Pitt’s program floundered with the script during Majors’ second, completely awful, tenure as head coach, Pederson, who said back then it was time for the athletic programs to move on, committed an unforgivable sin in the eyes of many Panthers fans. A few logos were instituted over the years. Then, On Friday and seemingly out of nowhere, Pederson announced the script was returning to Pitt’s football helmet, while the current block-lettered Pitt, which is pretty sweet in its own right – would remain the athletic department’s main logo. Celebration erupted. Pitt twitter exploded with glee. Oct. 24, 2014 will be forever recognized as the day the script returned to Pitt football. So, what does it mean? Not much really, though the timing is certainly interesting. Pederson appeased a salty portion of Pitt’s disenfranchised fan base. And no doubt merchandise will be sold. The script will probably add a few more eyes of this afternoon’s homecoming against Georgia Tech. But, until Pitt starts recruiting better players, the script isn’t bringing back the glory years. This entry was posted in College football, Pitt, Sports and tagged Pitt, Pitt football, Pitt homecoming, Script helmet, Script Pitt, Steve Pederson on October 25, 2014 by mikekovak. Living in South Oakland gave me two fake teeth. We were also a naive posse. I came from the mountain town of Somerset. Another hailed from Erie. There was a fellow from Silver Spring, Md., a guy from Scottdale and his roommate from near Williamsport. None of us were particularly street smart, and we certainly had no idea that, in the early 1990s, parts of Oakland were beyond unsafe to peruse. That’s what the guy from Erie yelled at the passing car full of women. I was trailing behind the other four, and, on the other side of Bouquet Street were three guys looking for trouble. No sooner had I looked up than my four “friends” had taken off and I was surrounded by the trio. They bullied me against a wall outside David Lawrence Hall and the shortest guy threw a forearm into my mouth. The trio all lunged at me and, somehow, I saw an opening and sprinted away across Forbes Avenue without looking for traffic and up the stairs into the Towers Lobby. The adrenaline was pumping, and I felt an overwhelming sense of relief getting inside that lobby, where another day later that school year I’d have an O pizza knocked out of my grasp by a Pitt football player on crutches. But, back on track, that’s when a much kinder Panthers football player I’d been a room down the hall from during freshman orientation stopped me. “Dude, your mouth is bleeding,” he said. It’s the type of experience that could sway many to seek refuge on a campus a little less busy. For a guy from Somerset, that could mean maybe Frostburg State or Pitt-Johnstown or even Millersville. Pitt was it for me. It still is. It always will be. Once South Oakland sets its claws into you, it never lets go. And, no matter how far removed I am from being a college student, South Oakland – from Bouquet to Atwood to Ward to Dan Marino Field off Parkview Avenue, will be home. It’s hard to say South Oakland is where I finally grew up, as my actions there weren’t usually responsible, but it’s impact was significant and strong. Sure, Pitt’s campus lacks white-picket fences and expansive stone buildings. Students must hustle across busy four-lane heavily traveled roads. Take away the Cathedral Lawn and there aren’t many patches of grass. Walking the streets late at night can be dangerous, though police helped clean South Oakland up considerably over the years. (Those fancy North Oakland residents rarely had much to worry about.) And there’s no doubt the area is more corporate today than it was 20 years ago. Gone are landmarks like Zelda’s, C.J. Barney’s, The Attic, Upstage, Telaropa, Miami Subs, Roy Rogers in the basement of the Cathedral and Calico’s and some great apartments near campus that were demolished and turned into university housing. Pitt Stadium gave way to the Pete, though many of us believe that’s a significant upgrade. What Pitt lacks in landscapes it more than makes up for in grit and character. Oakland is the land of Mike Ditka, Jonas Salk, Andy Warhol, Anti-Flag and DeJuan Blair. People don’t choose Pitt because of a sports team or the ideal campus community. Pitt is chosen because it’s a great institution. It overflows with diversity and blends into its urban setting. It offers culture, music, arts, entertainment and the best porches/balconies in Western Pennsylvania. It bustles with energy. It’s alive 24/7. It bursts with pride. It wreaks of stale beer every Friday, Saturday and Sunday morning. In other words, South Oakland’s the perfect place. This entry was posted in Drinking, Pitt and tagged Oakland, Pitt, South Oakland, University of Pittsburgh on October 9, 2014 by mikekovak.